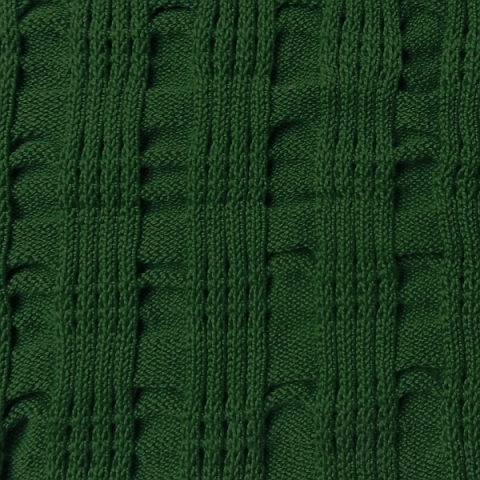 Pictured above is a closeup of a very ripply rib fabric. You can probably imagine it as a sweater. The fabric below is also a sweater fabric, a kind of plaid done with texture instead of color -- at least that was my intention when I designed it. But here's the thing: These are two sides of the same fabric. (Click any photo in this post for a closer look.) The color in #1 has been digitally changed, so as not to give the surprise away immediately. But which side is the right side? Some people have very strong feelings about this. Others have no idea. 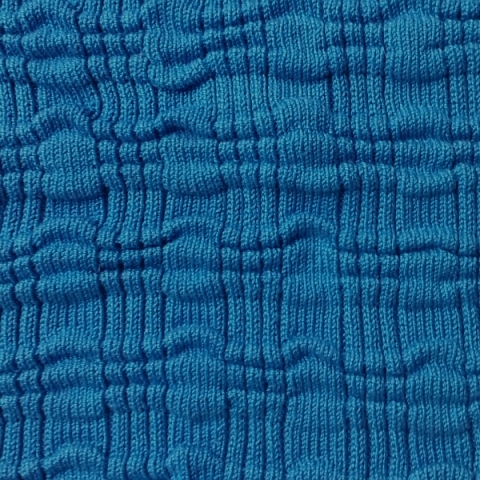 Just how do you determine the right side of certain knit fabrics, when each side is different from the other and either could be the public side? Is there a way to determine the right side from the wrong side? Let's take a look at some more knit fabrics. Sometimes the determination is easy. Fabric #3 has an interesting texture with the design created in floats. Most people however would recognize it as the wrong side of a two-color jersey. 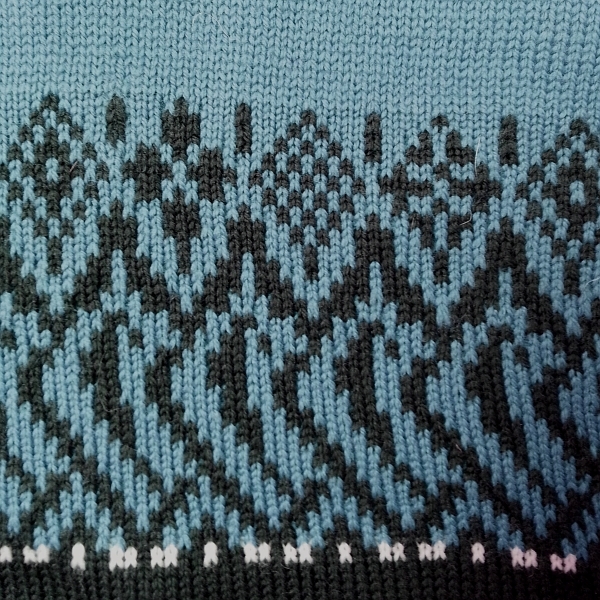 (Hand knitters often call this a fair isle design.) Turn it over and it looks like this. But floats don't necessarily make a side the wrong side. I posted fabric #5 on this site not too long ago. The multi-color floats create a texture on the grey. From the rolled over edge on the right, it's easy to see that #5 is a striped jersey. But would you use that simpler side (on the right hand side of the pic) as the outside of your garment? Or would you use the more complex side with obvious floats featured in the main portion of the pic for the outside of your sweater? So... how do you decide which side you'll use for the right side of your garment when the right side is not so obvious? Which would you choose in the examples above? Do you prefer 1 or 2? Would you ever use example 3 as the public side? What side would you use in example 5? Did I make the right decision with my cardigan? I'd love to hear your thoughts on this! There's a Part 2 coming up, where I'll share more of my thoughts on this topic. I started noticing rtw sweaters using what would be considered the "wrong" side as the right side maybe 5 years ago. 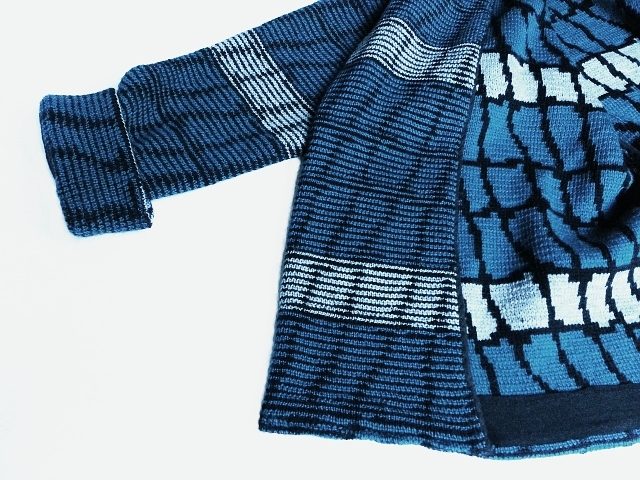 It created a different more modern look using old knit patterns. 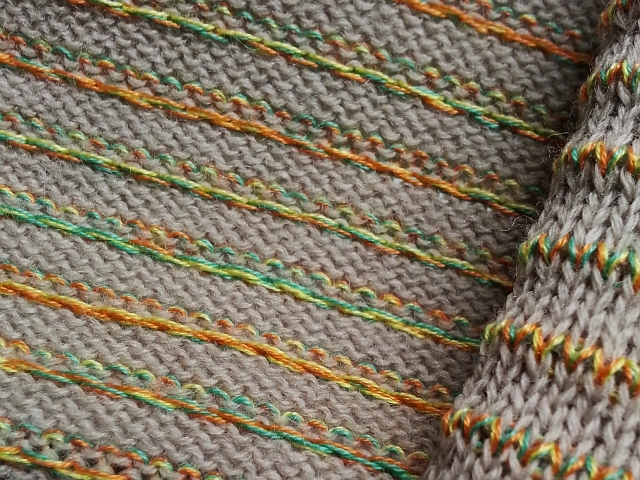 I noticed it because when looking at the inside of some of my current striped sweaters, I was having '80s flashbacks! I like the side you used for your cardi - it has a more updated look. Somehow, when you blur the contrast a little, it just feels fresh instead of dated. 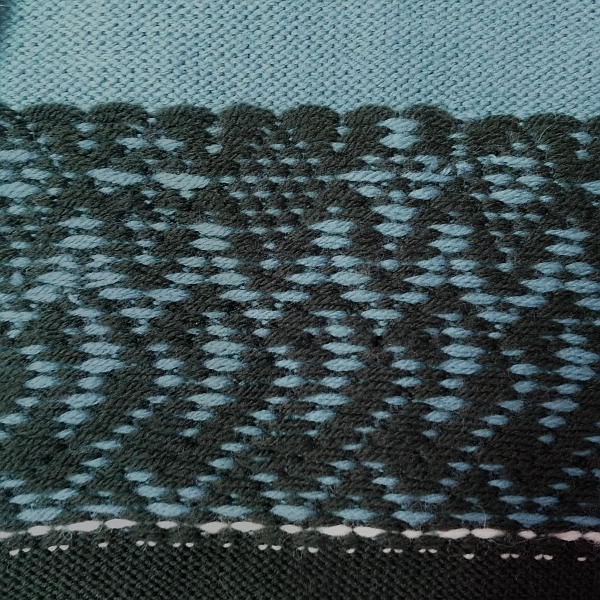 I find it interesting that the more visible floats you have in a knit design, the more digital it looks. I think I prefer example one over two only because #2 reminds me of slouchy socks for some reason. And I love both sides of #5 - I would have trouble choosing which side I wanted to use! Chuleenan, thank you! My unscientific poll results show that 1 is preferred slightly over 2! Fortunately, a sewer always gets both sides with this type of fabric and can make the decision at leisure (hopefully).